Fenella Kernebone is a television and radio presenter and producer as well as an MC, interviewer and writer. 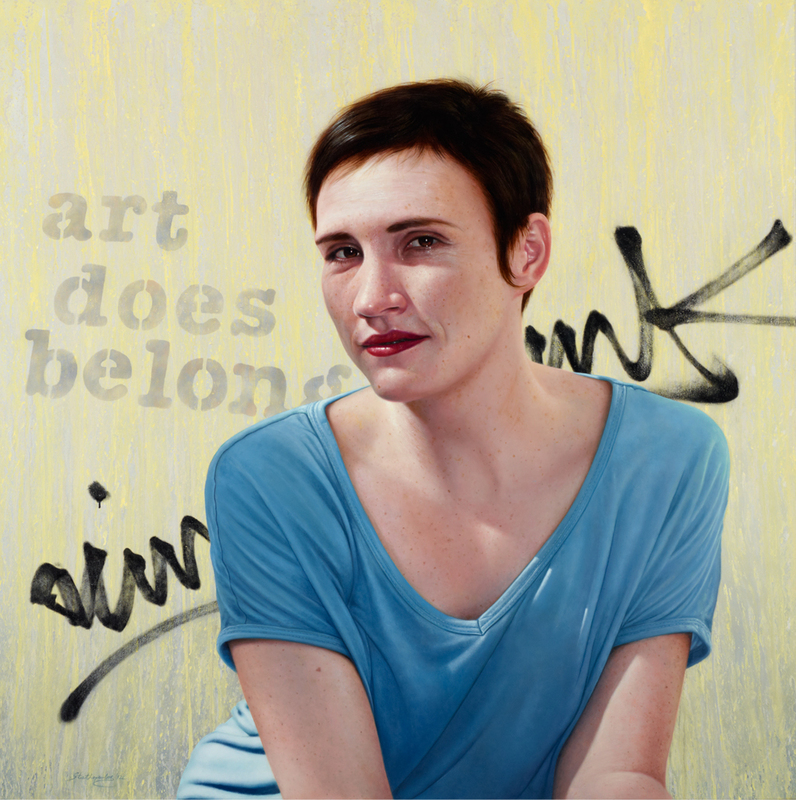 From 2010 to 2011, she hosted Art nation on ABC TV and, like many regular viewers, artist Nick Stathopoulos was incensed at the cancellation of their only dedicated local arts show – hence the title of this portrait: Art does belong. Kernebone first came to Stathopoulos’s attention as one of the hosts and film reviewers of the revamped but short-lived The movie show on SBS TV. She went on to present and produce on the ABC arts show Sunday arts. In addition to her current role on Radio National’s By design, Kernebone is also the host of her long-running, cult electronic music show The sound lab on Triple J radio. For Stathopoulos, her striking looks and charismatic screen presence made her an exciting Archibald subject. ‘She was young, smart, dedicated and utterly cool – the complete antithesis to those stuffy, decaying fossils that usually present art on TV,’ he says. Stathopoulos always intended to include a strong graphic device in his composition. A friend who lives in Melbourne’s Fitzroy – the graffiti capital of Australia – sent numerous images, one of which was the ‘Art does belong’ stencil. Not only did that provide the requisite compositional element, it also informed the painting’s political subtext and title. This portrait uses similar techniques Stathopoulos developed and employed in his successful exhibitions of hyper-real toys at Sydney’s NG Art Gallery. To achieve Kernebone’s luminosity, Stathopoulos first under-painted the portrait in acrylic, then detailed the likeness in oils. The spray-can graffiti in the background is actually replicated with a brush. Born in Sydney in 1959, Stathopoulos has worked as a professional artist since graduating from Macquarie University in 1983, working across numerous artistic platforms. He was a finalist in the Archibald Prize in 2003, 2008 and 2010; and was hung in the 2011 Salon des Refusés exhibition. He has also been a two-time finalist in the Doug Moran National Portrait Prize.